Tom Brady threw three touchdown passes in the first half. 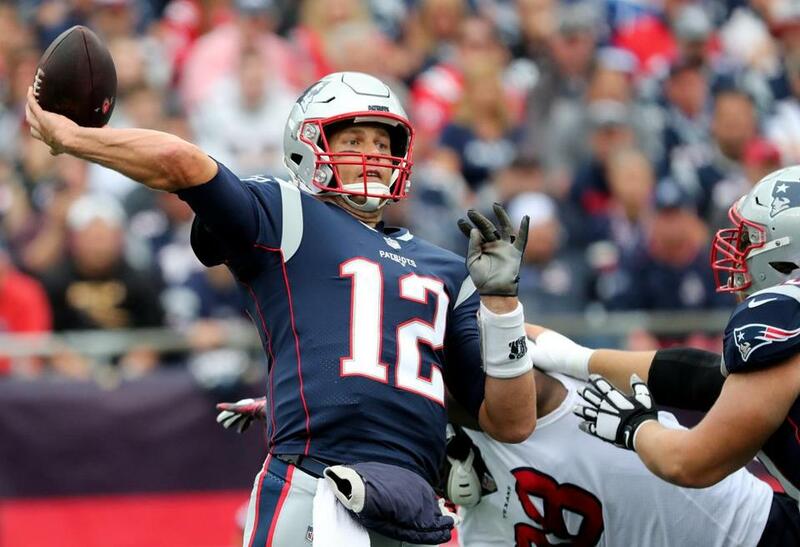 Tom Brady threw three touchdown passes and Stephen Gostkowski hit a pair of field goals as the New England Patriots defeated the Houston Texans on Sunday, 27-20, in the season opener for both teams. Brady hit Rob Gronkowski with a 21-yard strike in the first quarter, and found James White (12 yards) and Phillip Dorsett (4 yards) in the second quarter. 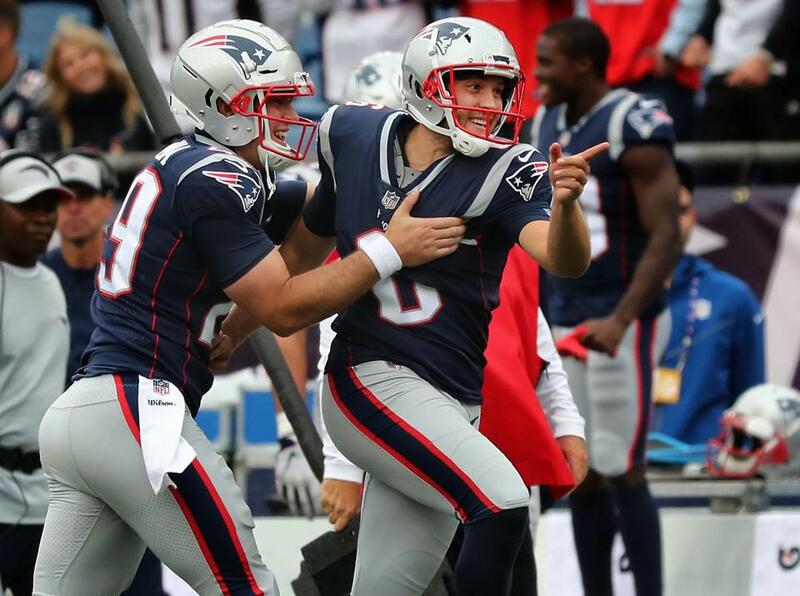 Gostkowski hit field goals of 39 and 36 yards in the second half. The Texans rallied late, pulling to within one score after Riley McCarron muffed a punt and Houston recovered on the 16. DeShaun Watson found Bruce Ellington for a five-yard touchdown six plays later. But Patriots punter Ryan Allen pinned the Texans on their own 1, and Houston was unable to go the distance for the tying score. A Hail Mary on the final play was knocked away by Patriots defensive back Jason McCourty short of the goal line. Ryan Allen (right) delivered a key play when his punt was downed at the 1 yard line late in the fourth. Brady completed 26 of his 39 pass attempts (67 percent) for 277 yards. Eight players caught passes from Brady, averaging 7.1 yards per reception, although Brady acknowledged the game was just a start. Wide receiver Phillip Dorsett caught seven passes on seven targets for 66 yards and a touchdown. Dorsett became the 69th player to connect with Brady for a touchdown. Dorsett was acquired last season in a trade with the Colts. Texans quarterback Deshaun Watson got off to a slow start, completing just five passes in the first half. Watson finished with 176 yards, a touchdown, and an interception. The Patriots defense kept the Texans out of the end zone until late in the third quarter. Gronkowski finished with seven catches for 123 yards. 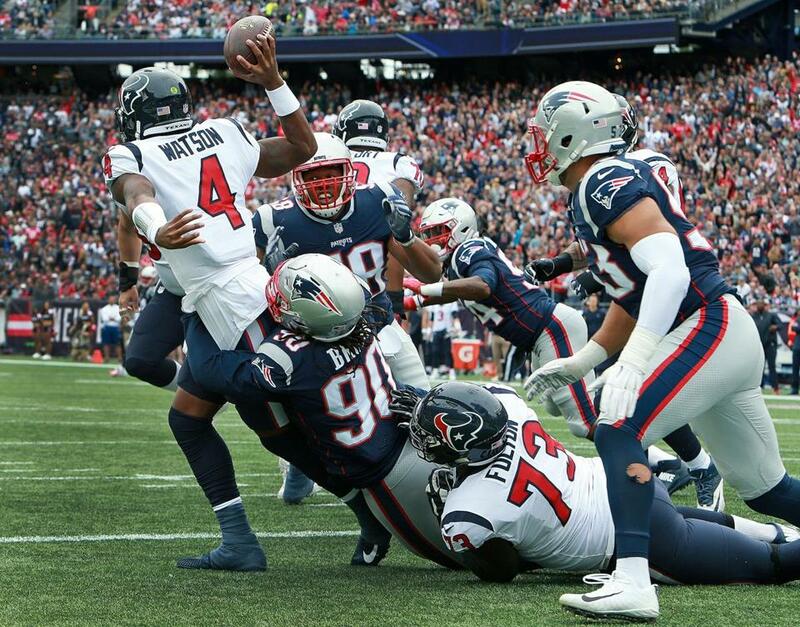 Malcom Brown had Texans quarterback Deshaun Watson in his grasp, forcing him to throw the ball away. 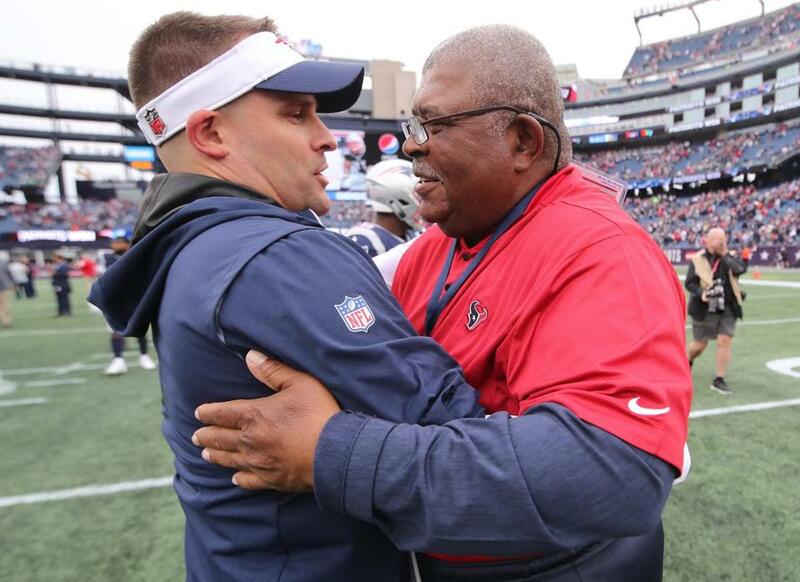 Patriots offensive coordinator Josh McDaniels and Texans defensive coordinator Romeo Crennel met on the field after the game. 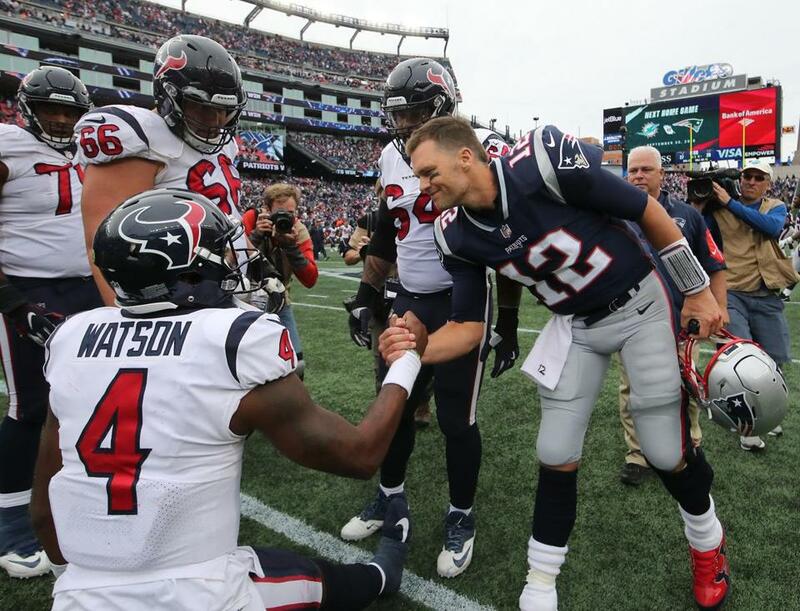 Tom Brady met Texans counterpart DeShaun Watson after the Patriots defeated the Texans 27-20. Patrick Chung broke up a pass intended for Ryan Griffin in the fourth quarter. Patriots 27, Texans 20 (0:05): Gronkowski entered the game at defensive back, but the Texans’ last gasp effort came up short. Patriots 27, Texans 13 (4:32): Patriots wide receiver Riley McCarron muffs a punt return attempt when the ball bounced off his face mask. Johnson Bademosi recovers for the Texans at New England’s 16-yard line. Patriots 24, Texans 13 (10:10): Texans cornerback Kevin Johnson exits the field after getting hit in the head. Johnson had suffered a concussion during preseason. He was immediately escorted to the locker room, and later the team announced he would miss the rest of the game. Patriots 21, Texans 6 (10:45): Bill Belichick is challenging a 17-yard reception by Texans wide receiver DeAndre Hopkins. The ruling on the field is a catch, and it was not overturned on replay. Patriots 21, Texans 6 (12:09): Safety Kareem Jackson strips Gronkowski after a 29-yard reception. Mathieu recovers the fumble — Gronkowski’s first in six years — at Houston’s 45-yard line. 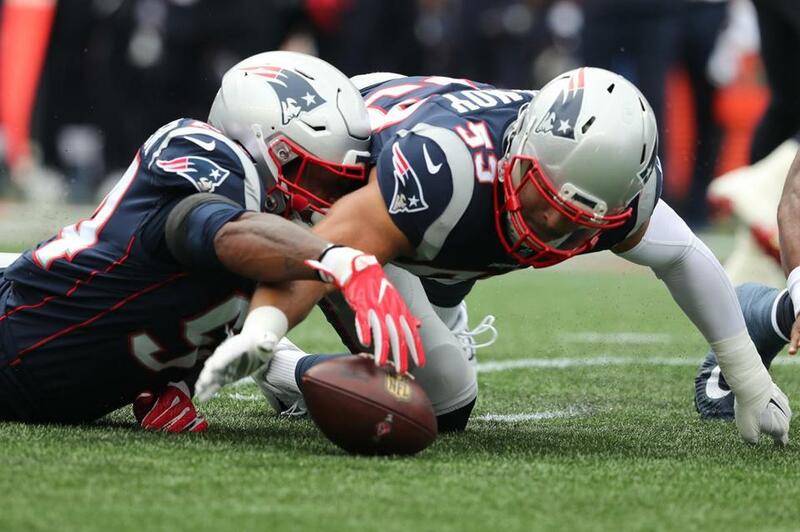 Hill was down after the turnover after getting hit by Patriots fullback James Develin. Hill left the field and visited the blue medical tent, and was later ruled out of the game. Patriots 14, Texans 6 (5:30): Stephon Gilmore intercepts DeShaun Watson in the end zone. The result of the play is a touchback. 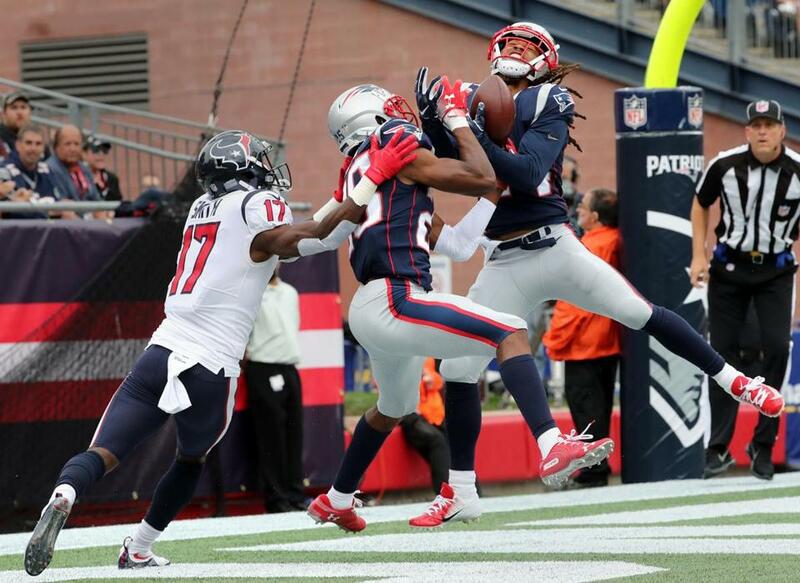 Stephon Gilmore intercepted a pass in the second quarter in the end zone. Another good Red Zone stand by the Patriots' D leads to a 36 yard FG by Fairbairn. Patriots 14, Texans 3 (12:38): New England caps a 10-play, 75-yard drive with a 12-yard touchdown reception from Brady to White. Brady completed five of his seven pass attempts on the drive. Phillip Dorsett, Jeremy Hill, Chris Hogan, Burkhead, and White all recorded receptions, while Burkhead and Cordarrelle Patterson rushed for a combined 15 yards. Tyrann Mathieu intercepted a Tom Brady pass intended for James White. First-quarter stats: Brady finishes with 7 completions to six different receivers for 63 yards. Watson has one completion on six attempts. Burkhead leads Patriots running backs with 22 rushing yards on five carries, while Miller has 36 rushing yards on four carries for the Texans. Patriots 7, Texans 3 (2:33): Houston gets on the board with a 42-yard field goal by Ka’imi Fairbairn. 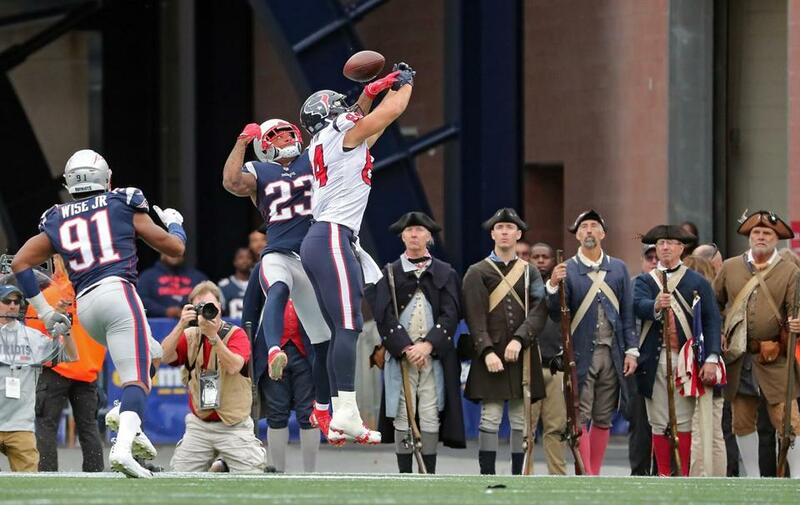 The score came after the Texans’ Tyrann Mathieu intercepted a Tom Brady pass at the New England 17. 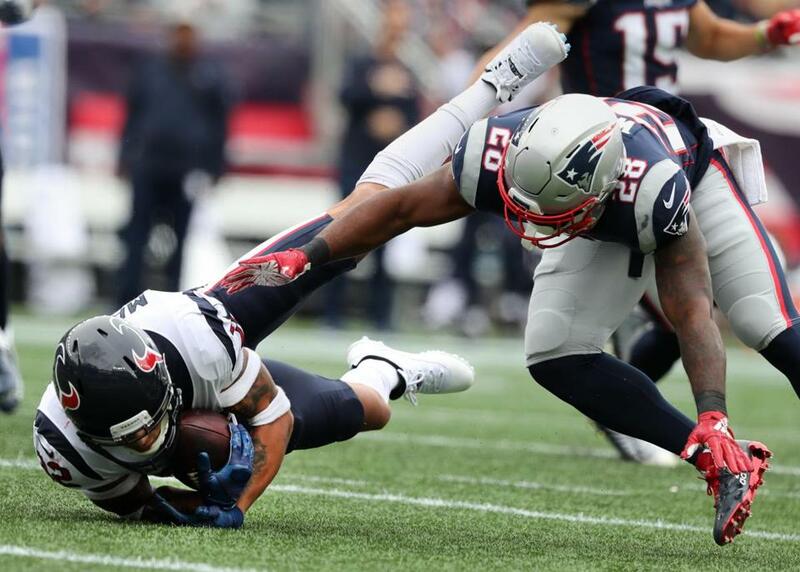 Patriots 7, Texans 0 (4:06): Texans safety Tyrann Mathieu intercepts Tom Brady on a pass intended for James White. Houston regains possession at New England’s 17-yard line. Patriots 7, Texans 0 (4:22): Texans defensive end Christian Covington is down on the field and exits the field. He visited the locker room and is questionable to return with a thigh injury. Patriots 7, Texans 0 (11:50): Tom Brady connects with Rob Gronkowski for a 21-yard touchdown reception. Patriots 0, Texans 0 (12:58): At Houston’s 19-yard line, Dont’a Hightower recovers a fumble off a failed handoff from Texans quarterback Deshaun Watson to Lamar Miller. Dont'a Hightower recovers the fumble. Patriots 0, Texans 0 (13:30): The Patriots go three-and-out on their opening drive of the game. New England ran three rushing plays (one carry by Rex Burkhead and two by James White). The Patriots will receive the ball to start the game. The Texans won the coin toss and opted to defer. Running back James White, center David Andrews, safety Devin McCourty, and wide receiver Matthew Slater were out for the toss. Celtics point guard Terry Rozier is at Gillette Stadium. Swapping out his Drew Bledsoe jersey for a Tom Brady version, Rozier opened the locker room door for the Patriots and pumped up the home crowd. Tom Brady is wearing his new helmet, the Riddell Precision Fit SpeedFlex. Brady is one of several NFL players who have to change their helmets by the start of the 2019-20 season after 10 styles were banned by the league for performing poorly in laboratory research testing for impact severity. Players may continue to wear the banned styles during the upcoming season, but Brady has already swapped out his Riddell VSR-4 for an approved style. Patriots: TE Jacob Hollister, OL Brian Schwenke, WR Chad Hansen, DE Derek Rivers, CB Keion Crossen, RB Sony Michel, CB JC Jackson. Defensive end Keionta Davis will make his NFL debut, getting the nod over Rivers, who was a healthy scratch. Linebacker Ja’Whaun Bentley, the only rookie active for the Patriots, and wide receiver Riley McCarron will also make their NFL debuts. Offensive tackle Marcus Cannon and safety Nate Ebner are both active, after initially being listed as questionable. Neither player took any snaps during the preseason. Texans: WR Will Fuller, WR Keke Coutee, CB Kayvon Webster, LB Duke Ejidfor, OL Kendall Lawn; DE Carlos Watkins, DE Joel Heath. Tailgaters were out early before the stadium opened. With football season comes traffic season on Route 1 in Foxborough. 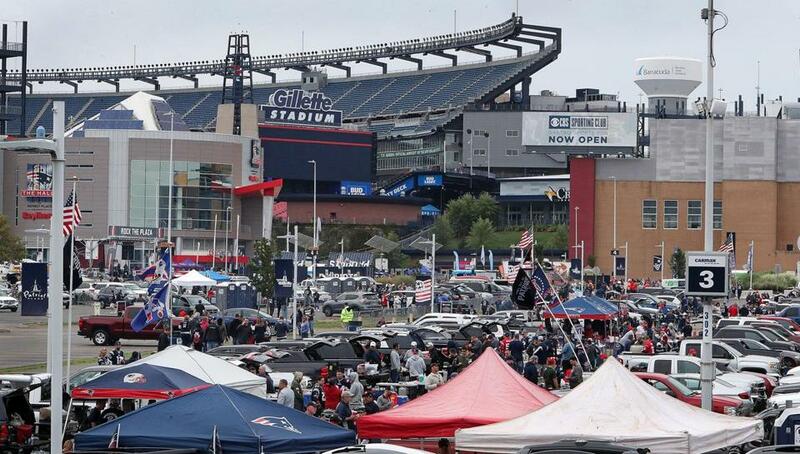 Fans made the trek to Gillette Stadium. ■ Five-year contract reportedly among reasons McDaniels stayed with Patriots: Josh McDaniels landed a five-year contract from the Patriots, one of the reasons the offensive coordinator did an about-face on the Colts’ head coach job, according to an NFL Media report. The extension was hammered out during a meeting with team owner Robert Kraft and Bill Belichick shortly after the team returned home from Super Bowl LII. McDaniels had one year left on his Patriots contract when he accepted the Indianapolis post. Read the full story here. ■ Patriots rookie running back Sony Michel is not expected to play, according to multiple reports: Michel is still recovering from a minor procedure that drained fluid from his knee. The 23-year-old missed the majority of the preseason, but he returned to practice on Aug. 27. Michel was limited in practice this week. ■ The NFL is reportedly not expected to implement its new anthem policy this season: ESPN reports the league’s new policy surrounding the national anthem is going to be no policy. ■ Texans wide receiver Will Fuller is not expected to play, according to multiple reports: Fuller, who has been battling a hamstring injury, was limited in practice this week. He caught 28 passes for 423 yards last season.